“We’re integrating development of our print and digital operations,” Fiji Sun Publisher/CEO Peter Lomas said. Intense digital and print media training by three Indian experts wrapped up at the Fiji Sun with a special presentation to the Asia Media Design team. 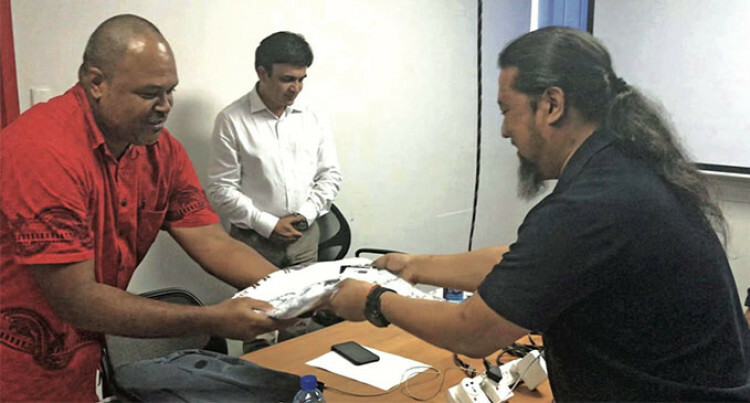 Jai Kumar Sharma, Roshan Tamang and Manav Mishra were given Flying Fijians jer- seys in a farewell held in the Fiji Sun’s Gorrie Street newsroom. The presentation of the jerseys was special. It signified the teamwork emphasised throughout. Plus the keen interest in Fijian rugby shown by the Indian trainers. Why were the team of experts from India here? Mr Lomas said the Fiji Sun will roll out a range of developments that will extend and enhance its reach and services. This followed extensive research conducted for the Fiji Sun by Western Force Research and Pulse Insights, both experts in the Fijian media market. The training team from India were from longtime Fiji Sun partners Asia Media Design. Jai is the founder and head of Asia Media Design and a former top editor with the world’s biggest English-language daily newspaper, the Times of India. In more than three decades in journalism, he also worked with such major media houses as The Hindustan Times, The Indian Express, Outlook, India Today and The Economic Times. He has conducted design training anddevelopment with newspapers across Asia, Africa, Europe and the Fiji Sun in the Pacific. Roshan is Digital professional with a total of 22+ years of expertise in mass media (18+ in Digital) with a proven track record of successful deployment of Digital businesses for top media companies in India. He is digital media head at Asia Media Design, and worked as Vice President, Digital Editor and Product head with Times of India, CNN News 18, Quint, Indian Express and India Today. Manav is Asia Media Design’s IT specialist supervising software and business development and other major processes in India and internationally.